The GOLD PRICE lost $7.70 (0.7%) to 1,106.50. SILVER dropped 1.2% or 18.1 cents to close Comex at $15.063. 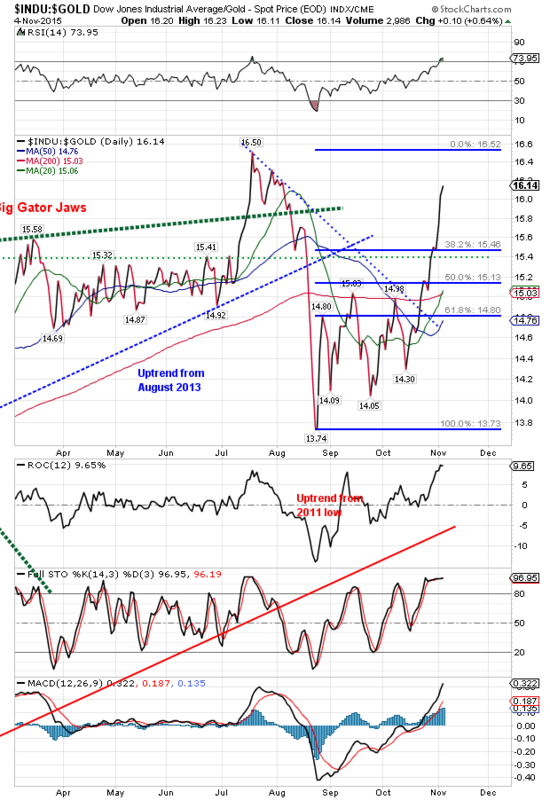 The GOLD/SILVER RATIO continues to defy the magnets above and stay low, a hopeful sign. Comex close was 73.458. The GOLD PRICE now has closed twice below its uptrend line from the July $1,072.30 intraday low. 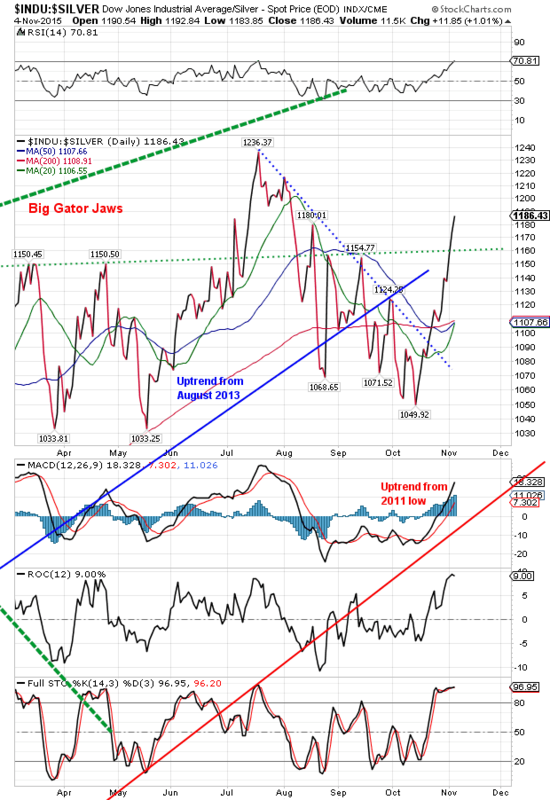 Moving averages are line up bearishly and the RSI is nearing very oversold. The price of gold has now fallen six days right hand running. I’d buy any sign of a turnaround. I’m going to say I don’t believe it will drop below $1,072.30, but then I’m just a nat’ral born durn fool from Tennessee. SILVER caught up with gold’s move yesterday and closed barely below the uptrend line from the August 1391c intraday low. May fall further, and certainly will unless it turns round very soon. Y’all ought always bear in mind that at crucial tops markets always SEEM their strongest. They seem ready to extend their rise forever. Yet surely they are set in slippery places, and their unique success announces their demise. Don’t know yet whether that has happened with stocks, and I have grimly kept my mouth shut, knowing that the latest phony rise owed everything to the FOMC’s lying blarney, and nothing to economic outlook. But today I noticed that Clive Maund, an outstanding technician, pointed out that the MACD indicator for stocks is at its highest level in 15 years, since the 2000 crash. I have not luxurious time today to list all the other portents, so leave it at this: If I were a Roman augur and Wall Street had come to me to read its future out of a freshly killed sheep liver, I’d have to point out that the liver was black and full of maggots, not a hopeful sign. Too soon to tell, but yesterday may have been the move’s top for stocks. More lower closes needed to confirm. Dow lost 50.57 (0.28%) to 17,867.58 while the S&P500 lost 7.48 (0.35%) to 2,102.31. Dow in gold at 16.14 oz today against the 16.50 oz July high, has stretched just about as far as it can without negating a turn. Needs a close above 16.50 to do that. Dow in silver stands at 1,186.58 oz against the July high at 1,236.37. Diverging today from stocks, the US dollar index, scrofulous, scurvy, blood-sucking parasite on the nation and the world, rose 76 basis points (0.78%) to 98. If it pierces this area and continues up, a very large dollar rally lies in store, which will help silver and gold almost as much as a concrete swimming suit. Friends, we live in a world of SEEMING, a world where spin, illusion, deceit, and appearance count for more than BEING. It’s annoying, irritating, and plumb exasperating sometimes, but it’s worth waiting and wading through the lies just to get to watch the truth avenge itself one time.